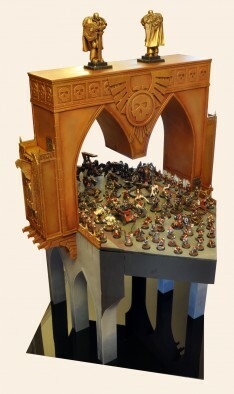 » Painting Wargaming Collections Part Seven: Triumph! 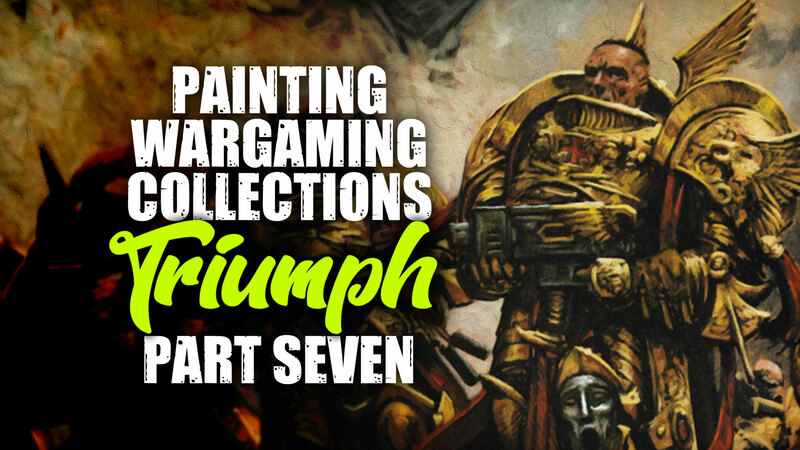 Painting Wargaming Collections Part Seven: Triumph! I’ve spent a lot of time talking with other hobbyists about their big projects too, and I’m always interested in hearing about the kinds of things that inspire them, help them get organized, and keep them motivated through the “dark times” that can befall any lengthy project. In this series of articles on “big projects” I hope to provide little nuggets of wisdom, gathered during my journeys. A completed army can now grace the gaming table! 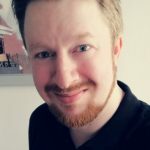 So, if you’ve stuck with me during this article series, you have read a great deal of my thoughts on making sure your inspiration for a large wargaming project can reach a successful conclusion. 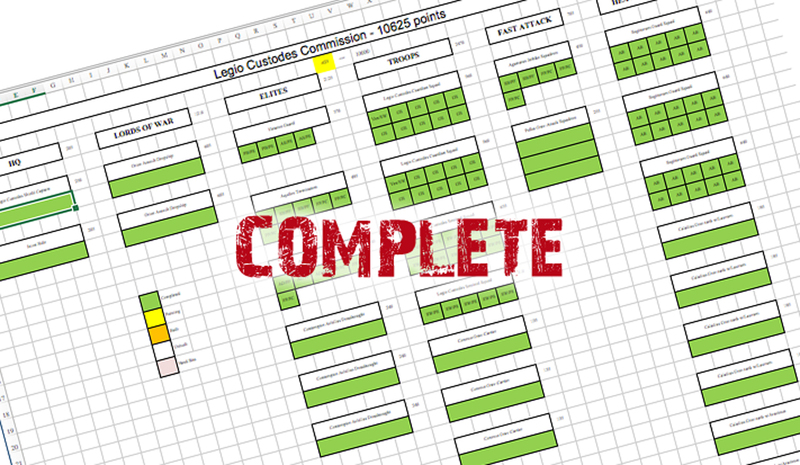 I always enjoy getting started on a project, and I try to make the middle bit (the work) as enjoyable as possible, but it’s that triumphant feeling when you complete your project – conquer it, if you will – that I really love. Note: The photos in this article are primarily of the army I have most recently completed, a 10,000+ point army of Legio Custodes, but the photo above is of my Adeptus Mechanicus entry for the 2013 Armies on Parade competition. Does The Same Thing Still Inspire Us? In the first article, I identified four different things that might inspire us: the miniatures, colour schemes, history/lore, and the way an army plays on the tabletop. There are others, but generally, most inspiration falls into these categories. At the end of the project, I recommend taking a quick look back at your “original” inspiration, does it still excite you? It really doesn’t matter if it does or not, just remember if your inspiration is the same, or if it evolved over the course of the project. Keep track of this over several projects and you might start to see a pattern for how you deal with inspiration. If you notice that your inspiration regularly evolves from the mechanical aspects (rules/gameplay) to the aesthetic (sculpts and colour schemes), then the next time you start a project you can think about skipping straight to the look and feel of an army. When we talked about the aim of the project (the goals), we looked at four different targets: adding to a collection, participating in an event, enjoying ownership, and creating a display/demonstration. Goals are the things we are working towards, the vision of success. They are important to identify and also to review as you are going through the process. You are certainly free to change your goals, adapt them to changing circumstances, as you progress. This way you have a better chance of succeeding with your project or at least aligning your vision of success with the end result. 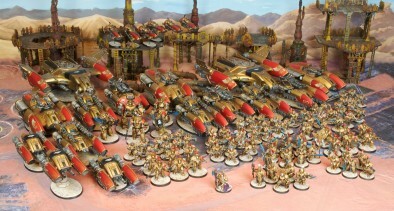 For example, did you get the army finished for the AdeptiCon Championships? If not, will you have it finished for the NOVA Open event in another five months? Were We Able To Manage Them? In the third article, we looked at expectations, understanding that our feelings of joy or disappointment by what is expected of us (by ourselves and others) and how close we can come to meeting those. I talked about three key elements: quality, quantity, and timeline. If you jotted down your thoughts at the start of the project you can now confidently determine whether you hit your expectations or not. Of course, if you adjusted them throughout the project, you’re much more likely to have met your expectations and will feel better about your results. 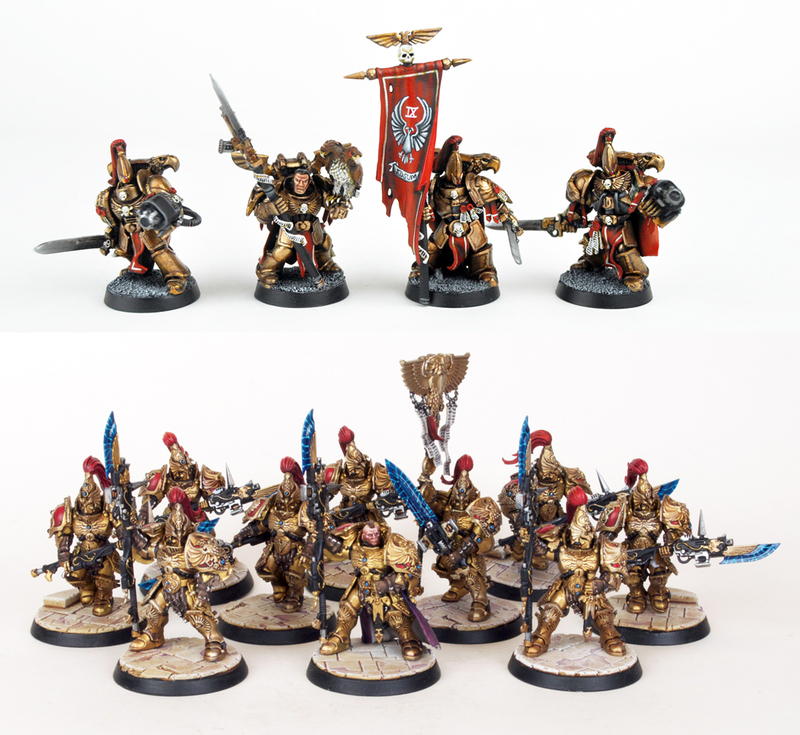 The photo above shows some Legio Custodes models I converted and painted in 2004, compared to a squad of Custodes I finished last month. Was It Helpful & Did You Follow It? If you think of your Inspiration as the reason you are setting out on this journey, and your Aim as the destination, the Planning is the map you need to create to get you there. 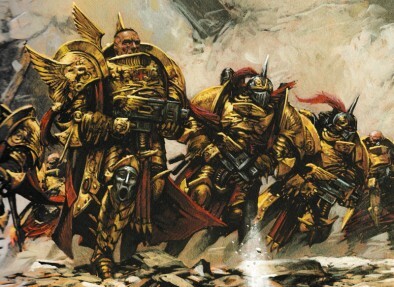 In the article focused on Planning, the largest one, we talked about EIGHT different things you need to tackle: deadlines, purchasing, assembly, colour schemes, painting techniques, basing, regularity of painting, and getting in a few games as you go. Was your map well-drawn and incredibly accurate, which showed gas stations and rest stops along the way? Or was it a little more like a rough sketch with charcoal and some hastily scrawled “’Ere be Dragons” near the edges? The idea of the review time is to decide if your map was just fine, or if you’d like to polish it a little more when you start your next wargaming army journey. How Tough Was It To Stay On Track? If you are sitting down in front of your finished project, then you were able to maintain the motivation to get you through. The question here is going to be how tough was it to make it to the end? It might also be fun to see if your motivations changed during the project. I know that mine can change depending on how much I have left to go and how many days I have left before my deadline. I’m very deadline driven, but I tend to work better with some more pressure, so having a few projects running at once helps me achieve that. One very important thing that I always say about painting, particularly when someone says that they haven’t been “in the mood” to paint, is that you should endeavour to make painting a habit, and not a chore. Set aside at least thirty minutes every day and get some painting done. It might just be the boots on a squad of Astra Militarum, but that means you are twenty boots closer to completion. Once you have painted every day for one or two months, it will have become a habit. I know I feel a bit twitchy if I don’t get to paint each day, like having painting withdrawals. Everything will feel like much less of a grind if you make painting a habit. And there we are. 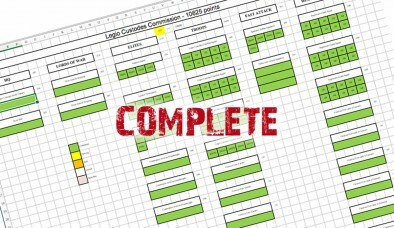 You have completed your big project and can now show it off to the world! Imagine yourself as a general who has returned victorious to Rome after a big campaign against the Gauls or the Visigoths. 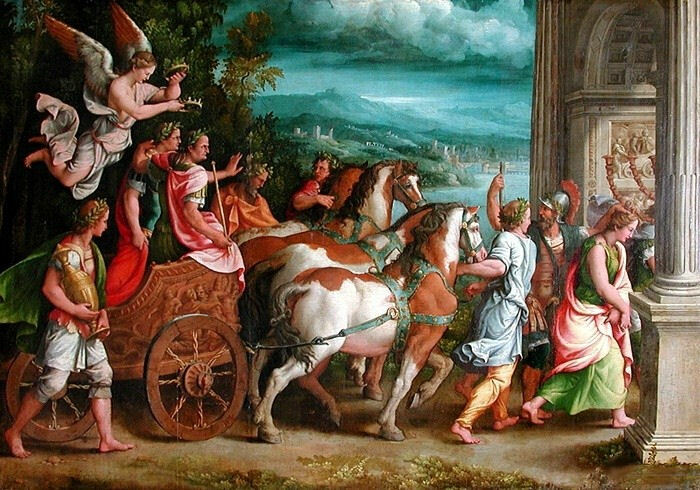 You ride the streets in a chariot, laurels around your brow, crowds cheering you on, and the Emperor waiting to proclaim your achievements for all of history to know! Take some time, revel in your success, enjoy it. You have certainly earned it. Of course, it is also important to remember that the Romans knew the dangers of too much praise. Apparently, a slave or companion would ride in the chariot with the general, whispering over and over to him “memento mori”, or “remember that you have to die”. For our purposes here, I think we can stretch the analogy to say this - you have achieved something pretty special in completing your army, celebrate it, but don’t rest on your laurels. There are always more miniatures we want to paint! "“Doing” will always beat “planning to do” when to comes to painting, but a little bit of thought before you launch into it can get you a lot further on a more regular basis..."
"...you should endeavour to make painting a habit, and not a chore"
I took particular notice of the army tracker. What are the different stages that you broke the project down into?